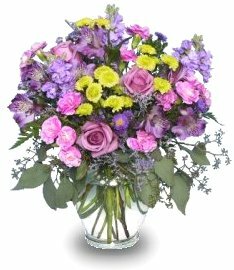 When you think of flowers, think of ours...Call Flowers by Vikki today! Flowers By Vikki has been serving the Herington, KS and surrounding area for over 36 years with flowers for all occasions from sympathy, anniversaries, birthdays, get well, just because and more... Our floral designers specialize in unique, custom arrangements that will make your special day, extra special! We are your full service florist offering the finest in fresh flowers, silk & dried flowers, green & blooming plants, plush stuffed animals, balloons, garden accents and a variety of gifts for all occasions. At Flowers by Vikki, we do complete wedding consultations, invitations, tuxedo rentals, etc. Call to schedule a consultation when you're ready plan your dream wedding or special event flowers and decor. We offer daily delivery to Herington Municipal Hospital, Zeiner Funeral Home and Carlson-Becker Funeral Home. Our shop is open to serve your floral and gift-giving needs.